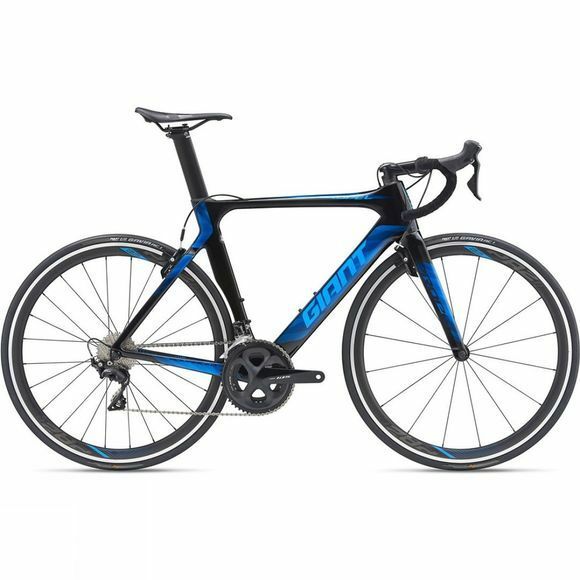 Propel Advanced 2 2019 a Giant race bike with pro-level road performance and the ultimate aero advantage. This is the bike for anyone seeking aerodynamic efficiency and integrated rim brakes. The main feature of the Propel Advanced range is the lightweight composite frame that has been tuned for a perfect ride quality, whether you’re sprinting, chasing or making your attack. Giant used data compiled from Computational Fluid Dynamics research and dynamic wind-tunnel tests to optimize the shape of every frameset tube and junction for overall system aerodynamics, so this bike is streamlined from every angle. This means minimal drag and maximum advantage against the wind. With proven aero performance, sharp yet stable handling, and one of the lightest frames in its category, the Propel Advanced 2 delivers in all areas. This lightning fast aero road has an advanced-grade composite frame that is both stiff and superlight and features an updated rim-brake technology that integrates the frameset with linear-style callipers to deliver outstanding braking power in most conditions. The bike features Shimano’s mid-level 105 groupset which is extremely reliable and known for it's efficiency and affordability making this an ideal choice for the budget conscious race riders. A full composite, lightweight and highly aerodynamic seatpost is engineered specifically for the unyielding demands of performance road riders. The frameset, including the new integrated stem and handlebar, features best-in-class weight and stiffness. Increased frame stiffness allows the rider to reach and maintain higher speeds with less effort. Reach your ultimate speed with the Propel Advanced 2 2019.